Canada is an incredible country to live, its no wonder so many people want to immigrate to Canada. For those who have been through the process of immigration to Canada they know it is lengthy and time consuming, but well worth it. There are a number of things that can prevent you from getting your Canadian citizenship and having a criminal record is one of them. Even if the criminal record is a minor offense like a DUI, Over 80, theft under, assault, uttering threats or fraud under, you can be denied immigration status. For those wishing to have a clearer path to immigrating to Canada they must obtain a pardon or record suspension to remove the criminal record. Even if the criminal charges were later withdrawn, dismissed, stayed, or discharged, the fingerprints still show up in the RCMP database and can raise questions by Immigration Canada. 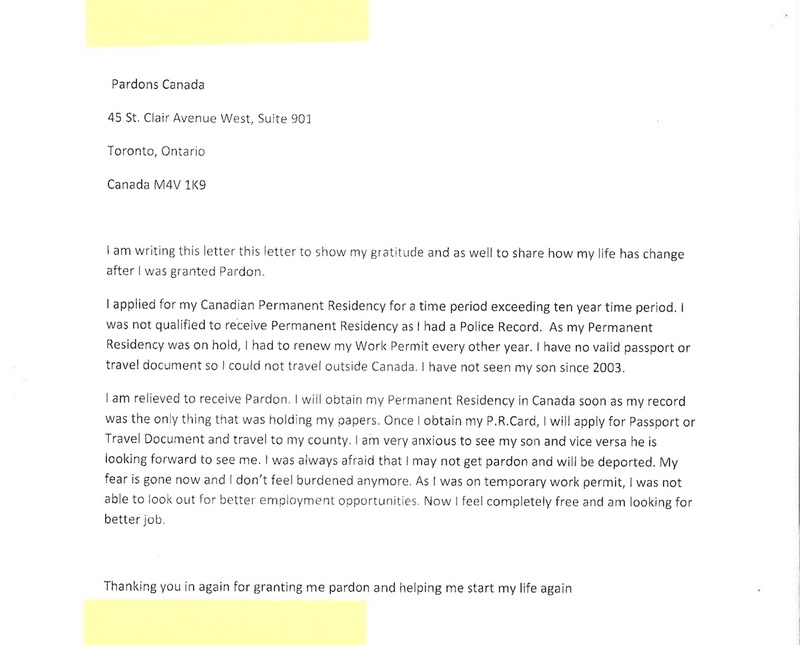 Here is a thank you letter from a person we helped to obtain a pardon. This person applied for his Canadian Permanent Residency but it was denied due to his criminal record of assault. Since his permanent residency was on hold he had to renew his work permit every other year which was expensive and complex. Also, he was not able to travel outside of Canada as he had no valid passport or travel document. He lived in fear of being deported and his freedom was limited due to his inability to travel. Even employment opportunities were limited due to his temporary work permit. Once his pardon was obtained he was completely free to gain his Permanent Residency and then his Canadian Citizenship.